Discussion in '2nd Gen. Tacomas (2005-2015)' started by IluvTEA, Oct 13, 2010. Got my new OEM grille in yesterday. I put it on and for some reason it doesn't look like it completely matches. What do you think? Is there anything I can do to make it match better? I ordered it through David at Town and Country (the deal Linwood set up)... so it not an off brand, it is straight from the dealer. Pro Comp 6" Stage 2 lift, N-Fab nerf bars, tinted windows, debadged, 6000k xenon headlights, 18" ProComp 7089 Wheels in black with BFG AT KO 33's, SnugLid tonneau cover, Line X'ed TRD skid plate. SOLD! Waiting for the 3rd Gen! When paint is formulated and is sprayed on different surfaces such as plastic and metal, both materials take color differently and they will be somewhat off. If you pay close attention, look at brand new cars at your local dealer. Look at the body, and the plastic bumpers. You will notice a slight variation in color which is normal. Pope953 That's a fact Jack! 35% up front, 20% in the back window tint, 15" Mickey Thompson bullet hole wheels, with 31x10.5 Firestone Destination A/T tires. 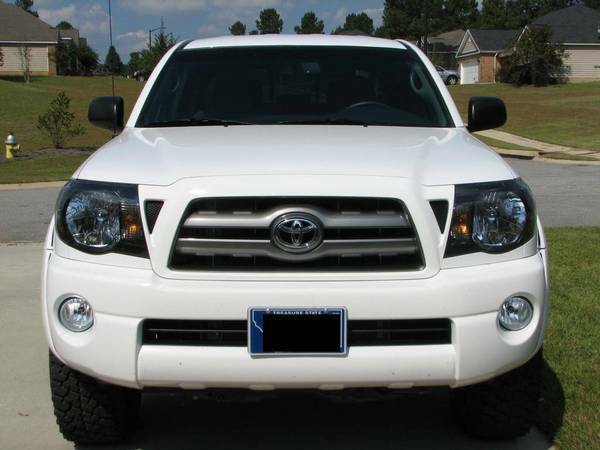 Glass Pack, High Flow Cat, S&B CAI, Custom Light Bar with 4 fog lights. 2 10" Rockford Fosgate P2 subs with 1000 watt Rockford Fosgate Amp, CB. I think it looks fine man, might be a slight difference, but not enough to worry. Looks horrible! You should take it off immediately and send it to me. I'll make sure to dispose of it for you. Original post edited with an extra picture. David was super nice and the grille was ordered/shipped last Friday. I got it Tuesday which isn't bad because of the holiday weekend. Thanks Blue, I guess I'm just being too picky. 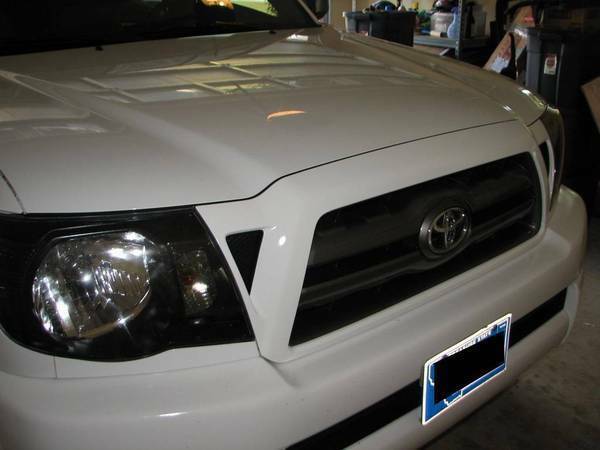 It just seems that Sport trucks grilles match perfectly... maybe because they're painted at the same time? Yeah sure, what's your address? I was going to post in on the free thread, but you saved me the time. Look fine to me ..
My wife and I are going to go paint the gray center parts, black and the T emblem white, (until I get the grillcraft). but we didn't want to paint it until we got some opinions on the white matching. I'll post some pics once we are done. Thanks everyone for reaffirming my picky-ness of the grille. 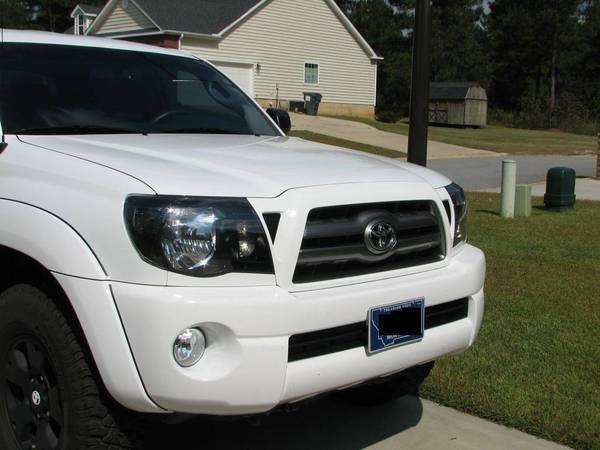 I was looking at my Tacoma grill last night. The silver in the grill looks different than the silver on the hood. It's not easy to notice it, but you can tell when you look closely. sloppyjoe They are more like guide lines. Thanks guys, I was beginning to think my eyesight was going or something. I'm glad I'm not crazy. I guess I'll just have to get used to it. I'm sure it will start to blend together after i get some wear and tear on the new grille. Just checked my mag gray it is a sport model so the grill came painted from factory and mine has slight variation. Nothing too obvious but under florescent light in the garage it is very obvious.